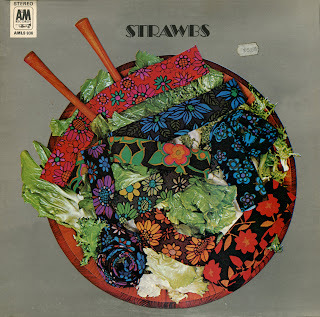 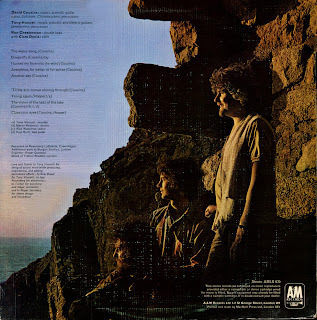 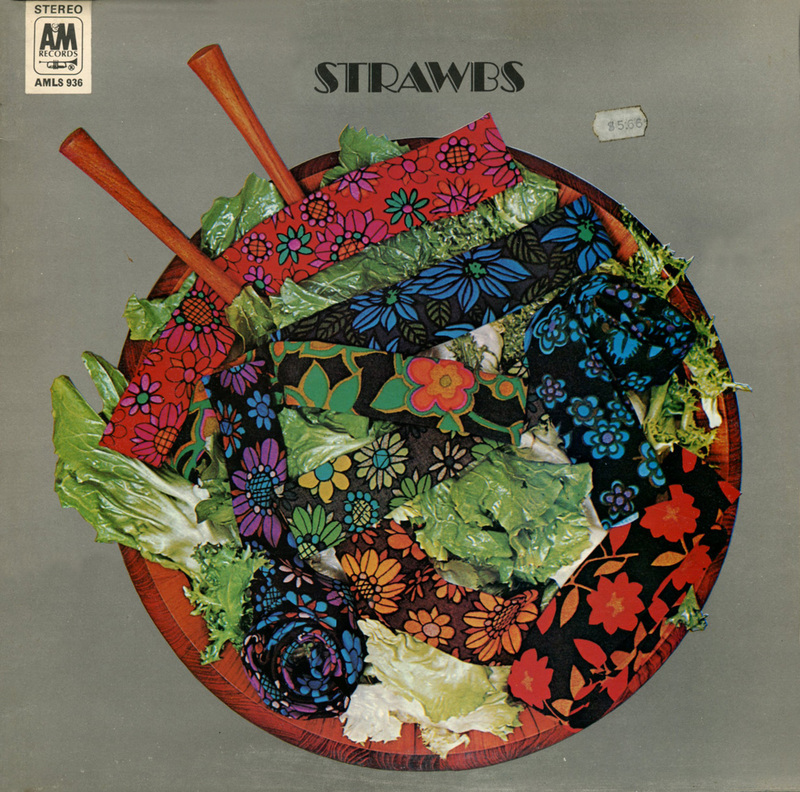 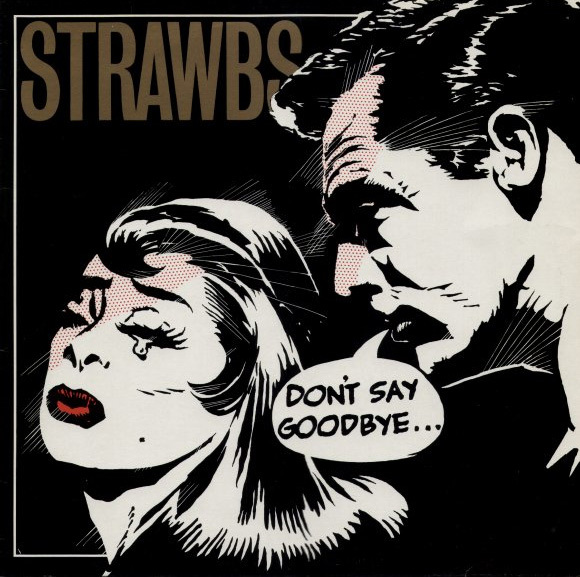 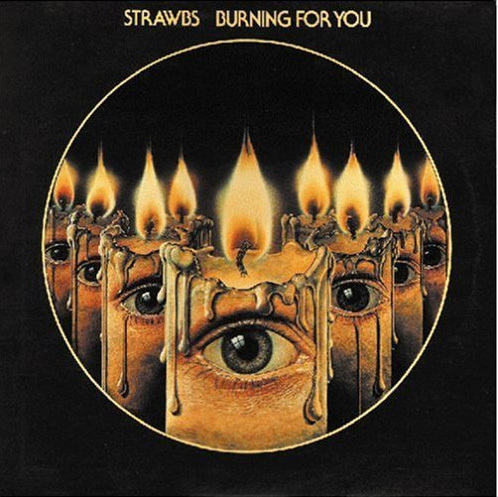 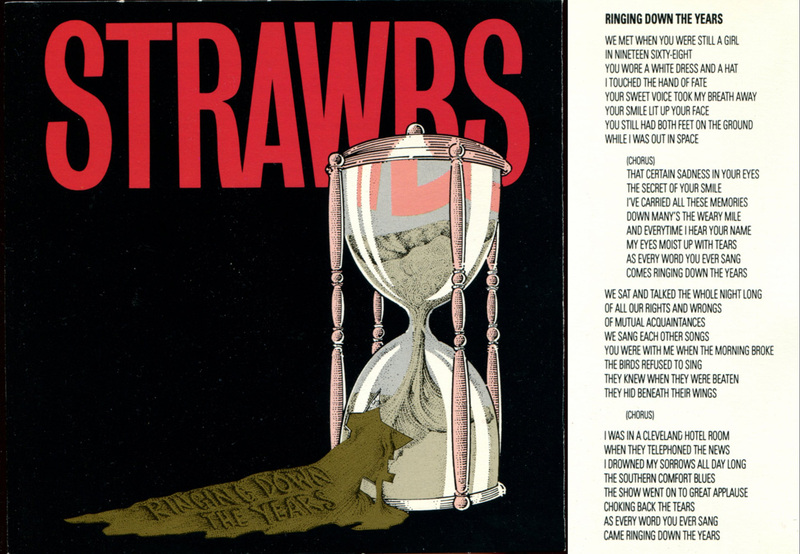 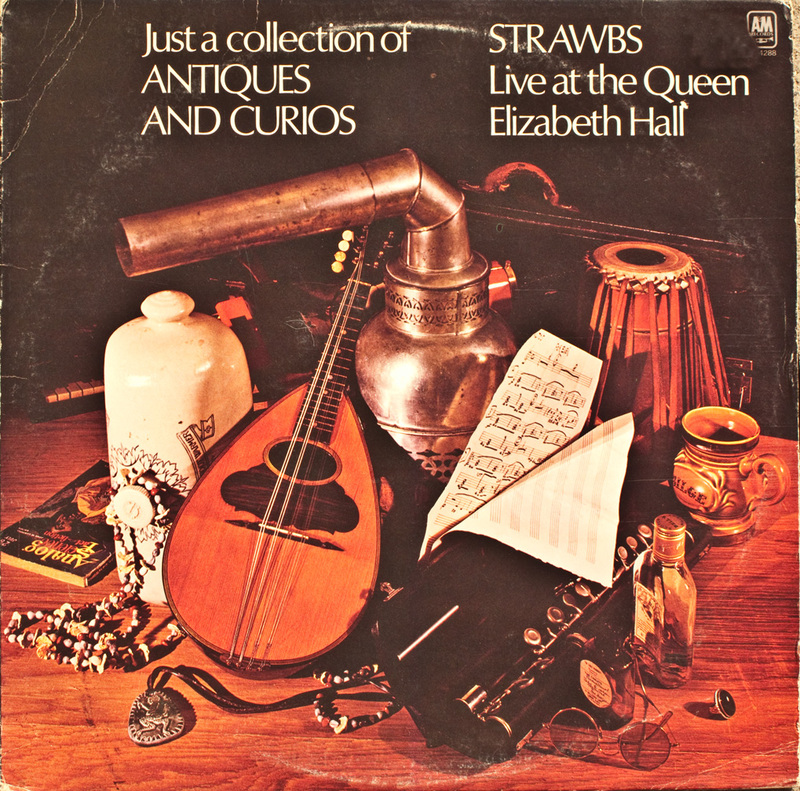 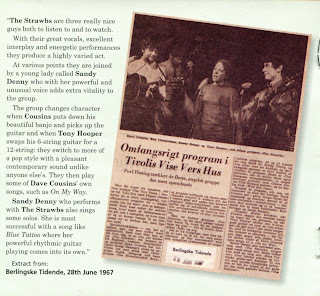 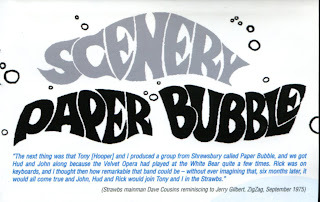 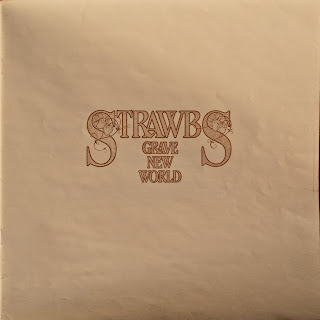 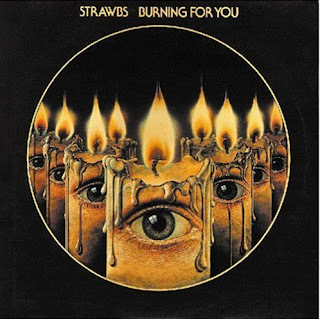 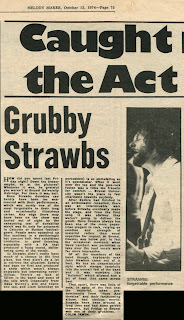 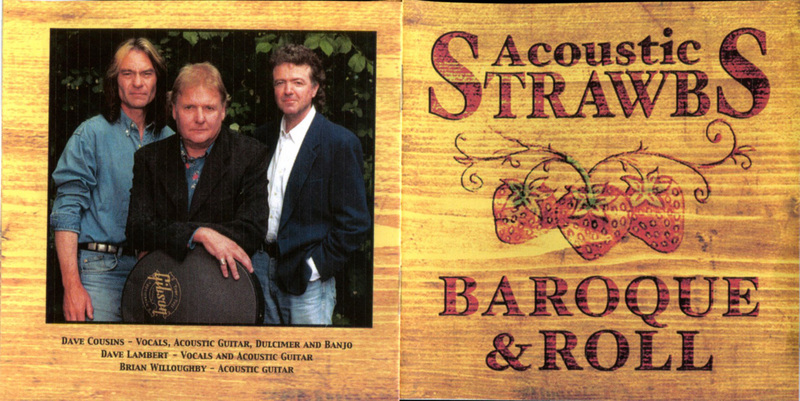 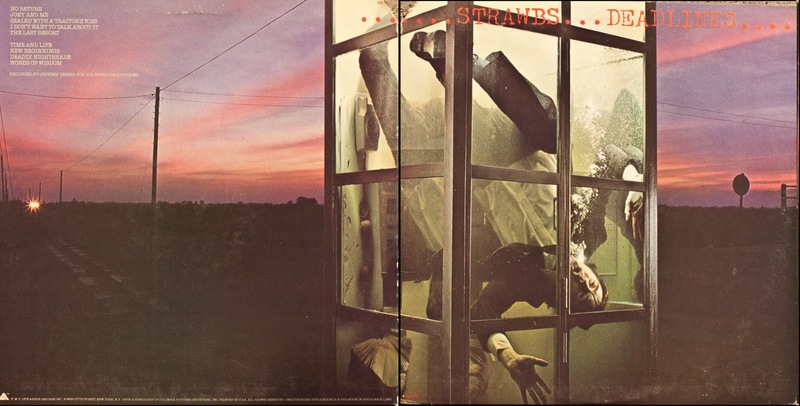 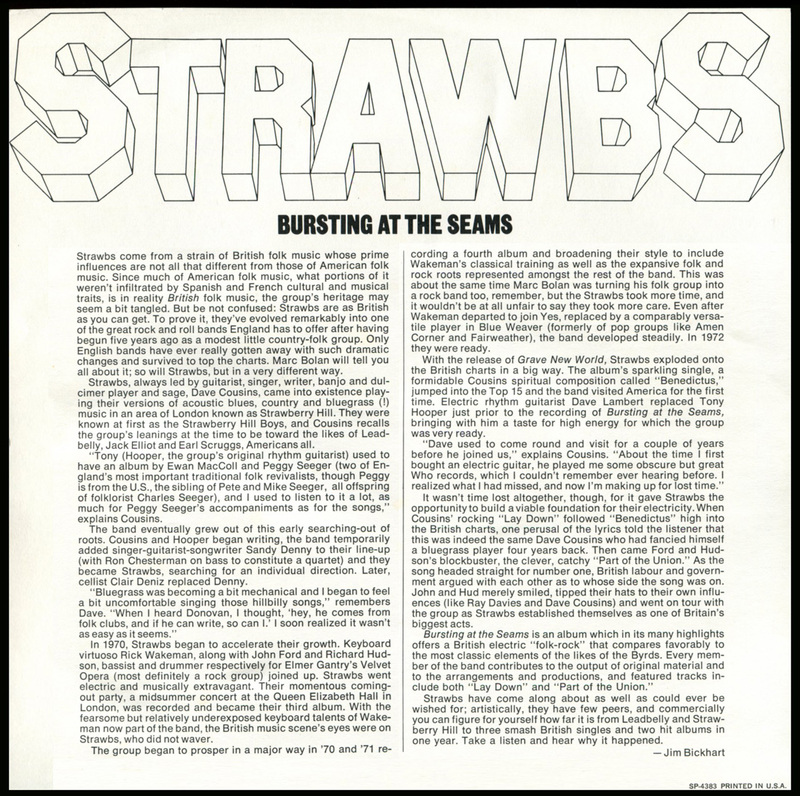 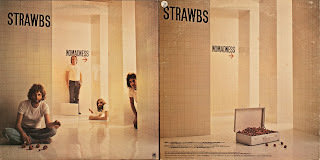 The Strawbs were a folk/bluegrass band formed in 1967 by Dave Cousins and Tony Hooper. 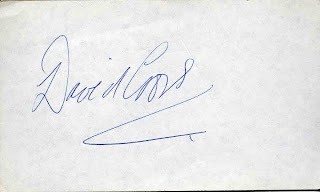 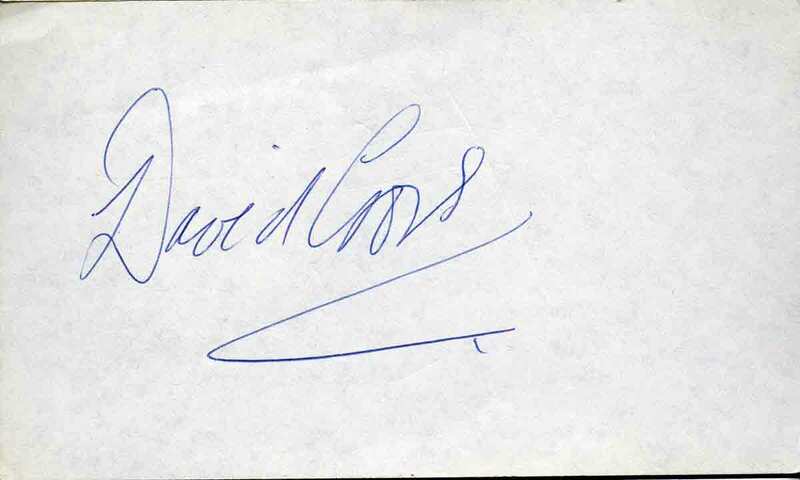 In 1968 Cousins discovered Sandy Denny playing in a folk club and invited her to join. 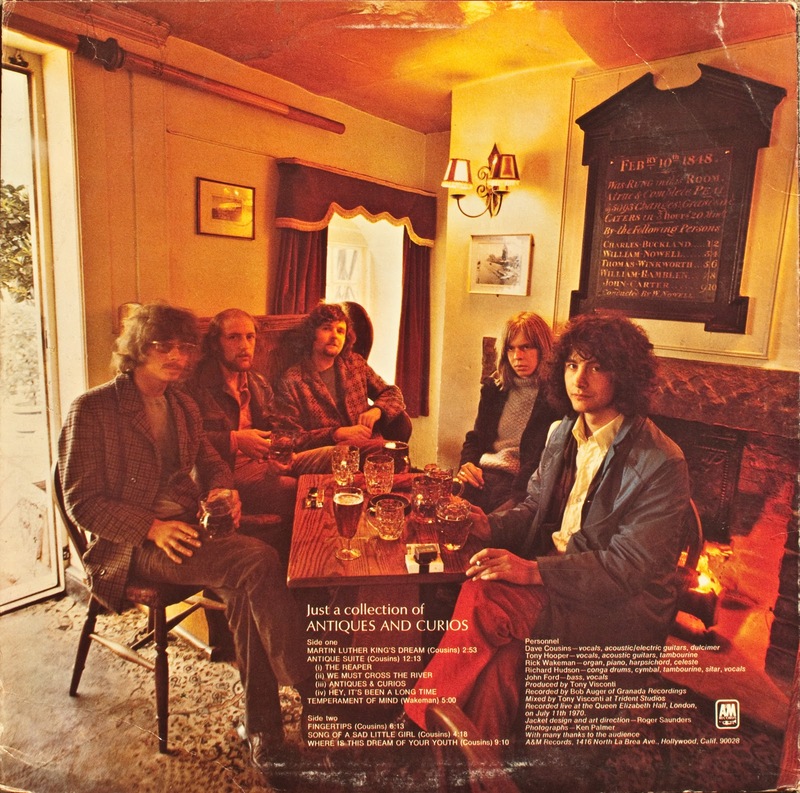 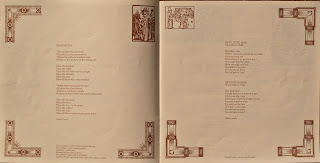 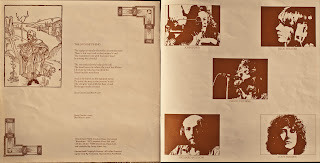 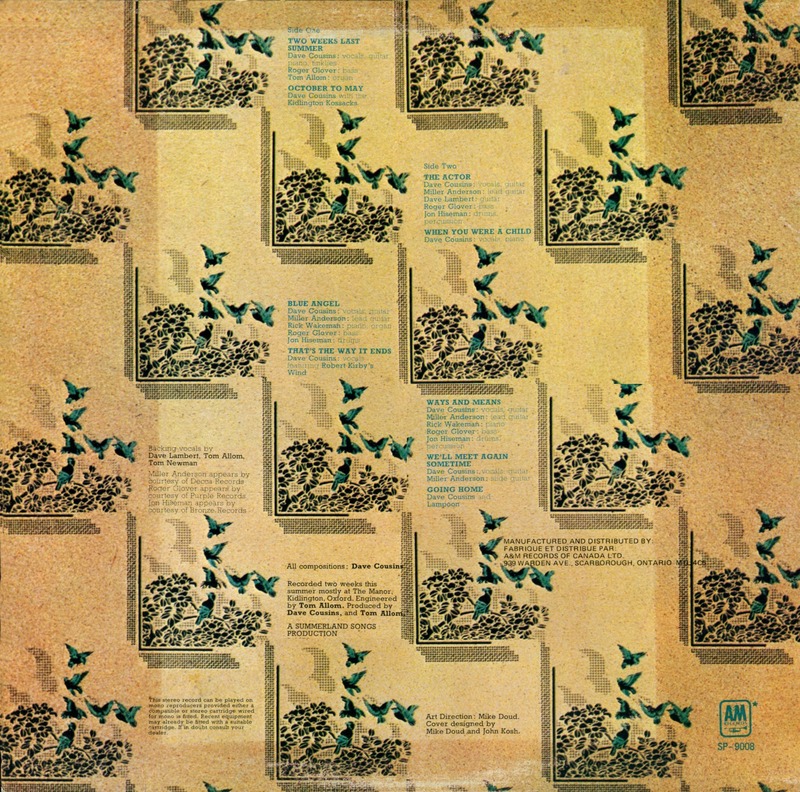 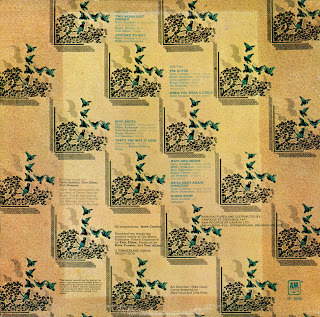 Some studio recordings were made, but Denny left to join Fairport Convention. 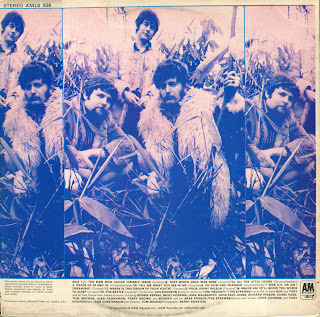 They released their first self titled album in 1969 with Ron Chesterman on bass. 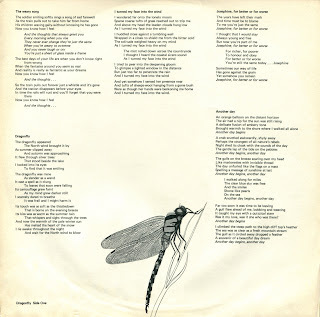 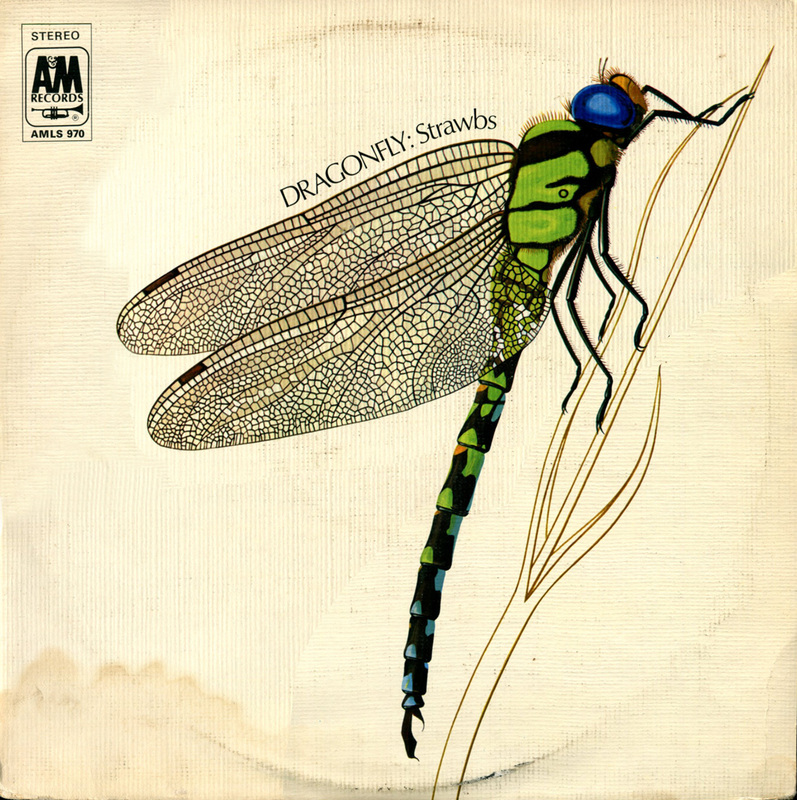 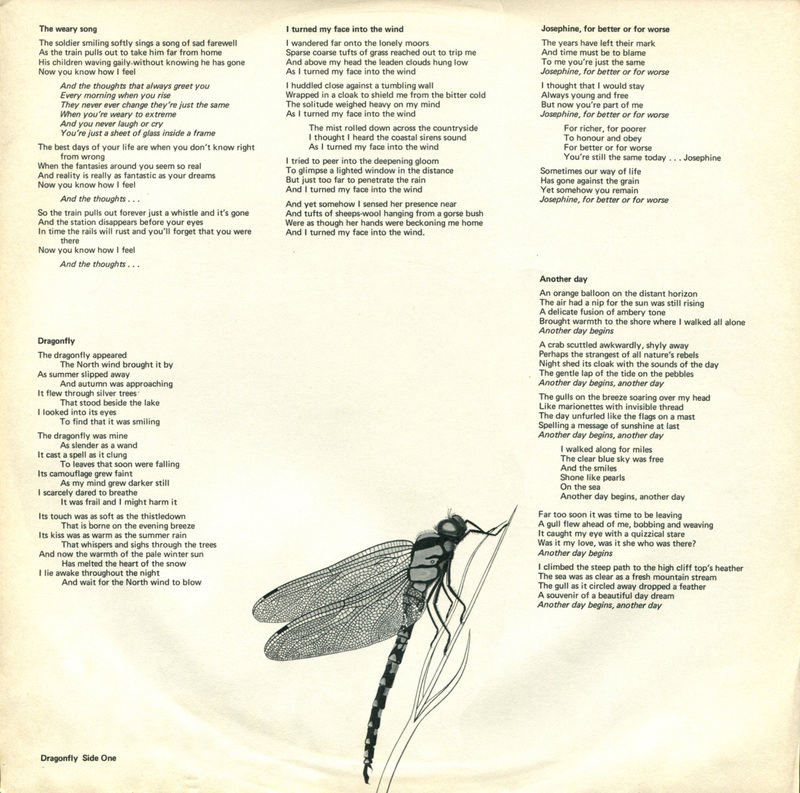 Rick Wakeman played piano on their second release, “Dragonfly”. 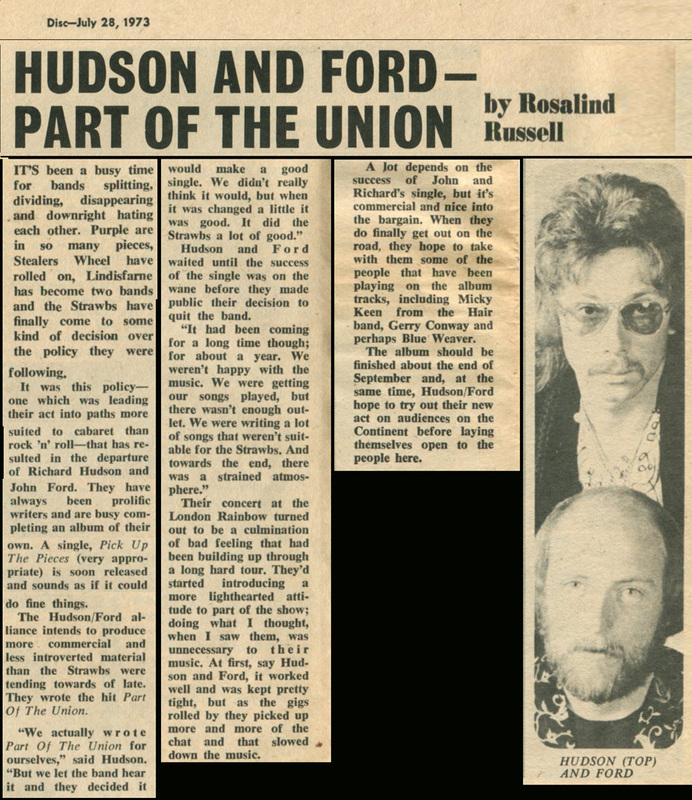 He officially joined the band for their next album, “Just a Collection of Antiques and Curios.” John Ford and Richard Hudson, from Elmer Gantry’s Velvet Opera, also joined at that time. 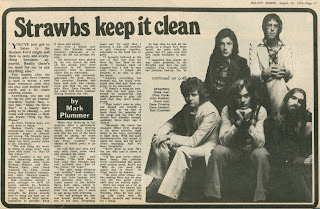 They recorded their next album, "From the Witchwood." 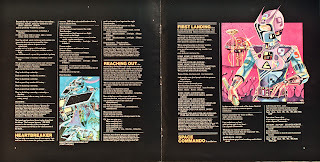 Then Rick Wakeman left to join YES and Blue Weaver replaced him for their next album, “Grave New World.” Then Tony Hooper left because the band was moving away from it's folk roots and becoming more of a progressive rock band. 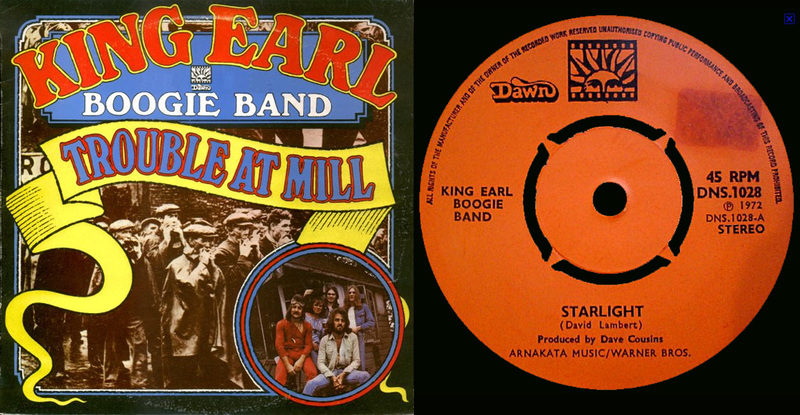 He was replaced with Dave Lambert, from King Earl Boogie Band. 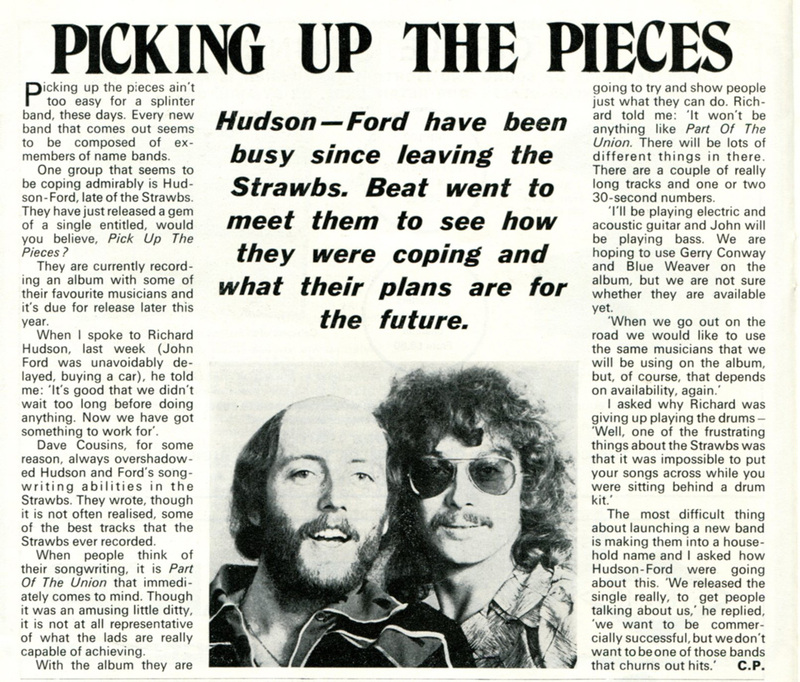 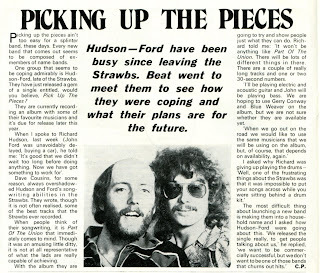 They reached their greatest success with the release of their next album, “Bursting at the Seams.” A rift developed between Cousins, John Ford and Richard Hudson. 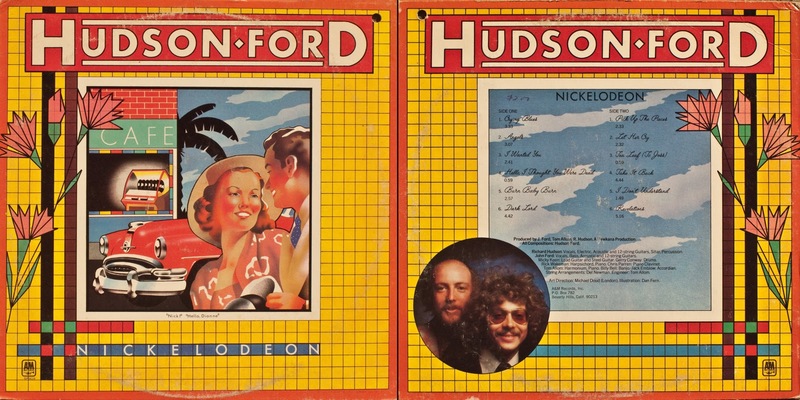 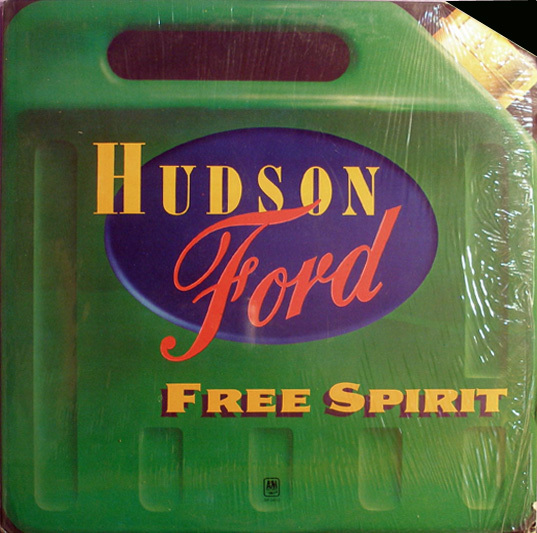 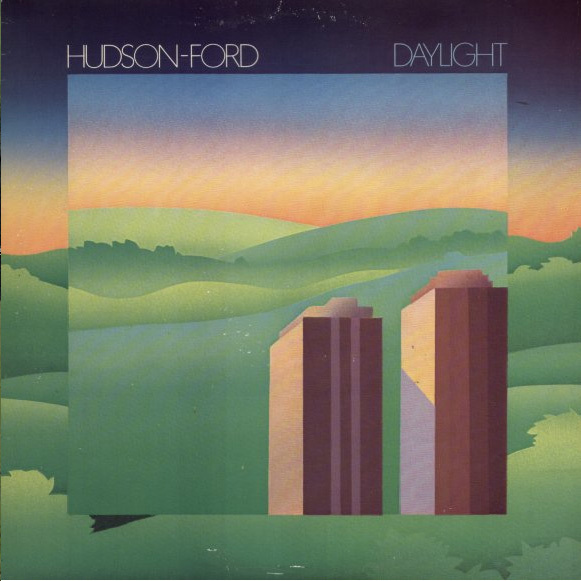 They left to form their own band, titled Hudson-Ford. 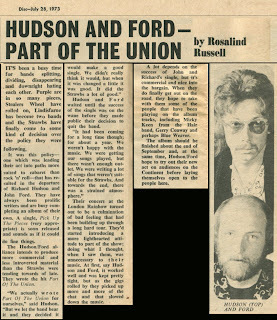 Then Blue Weaver left to join Mott the Hoople. 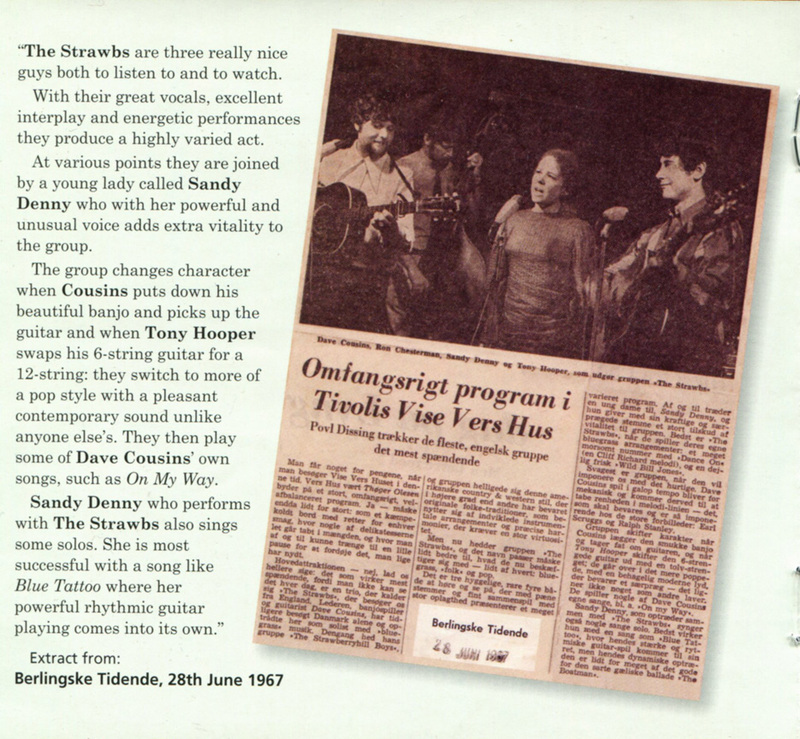 He was replaced with John Hawken from Renaissance, but later left to re-join Renaissance. 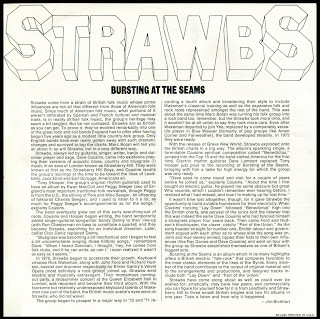 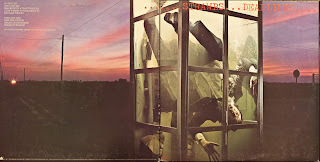 The Strawbs continued on in one form or another, but never achieved the same success they had in the early 70s. 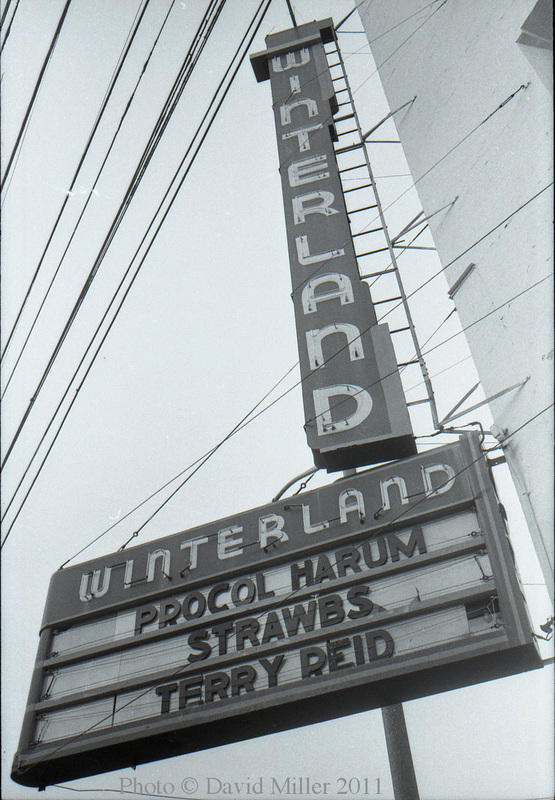 Winterland in San Francisco on May 24th, 1973. 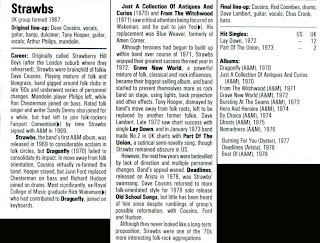 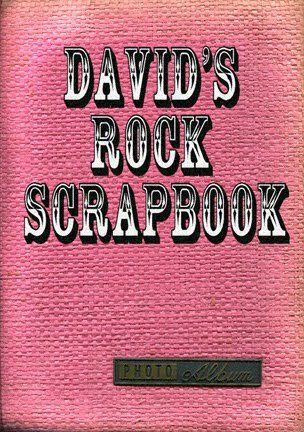 From "Illustrated Encyclopedia of Rock"
at the Seams" gives a history of the band. 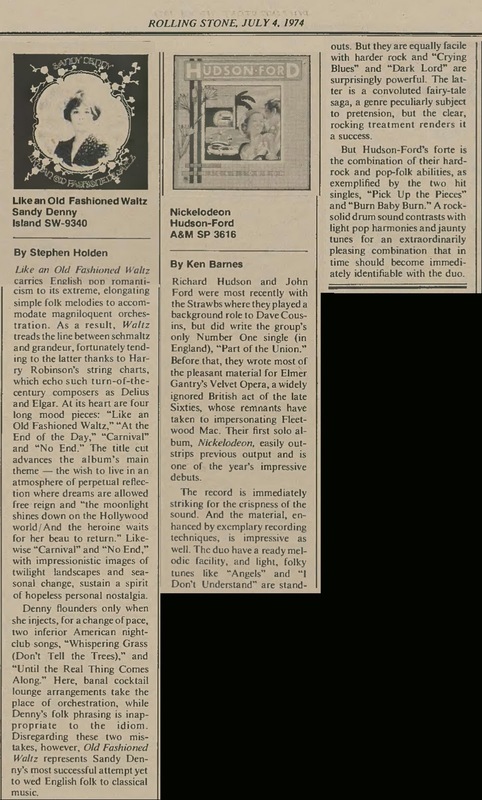 This review of "From the Witchwood"
is heard in these two tracks. 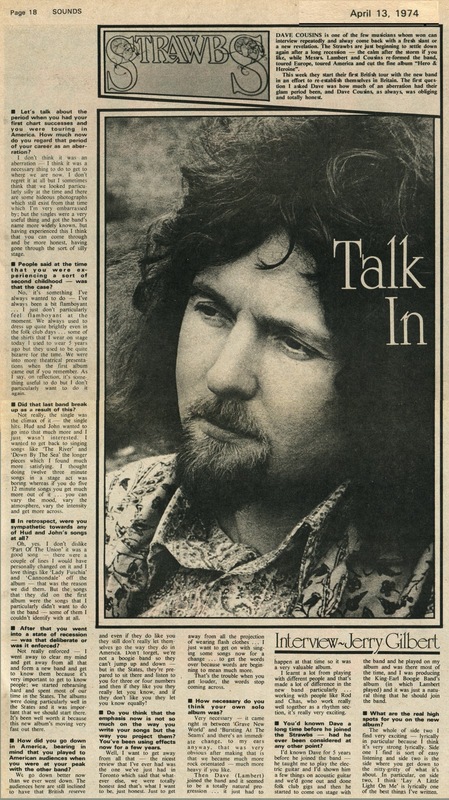 An interview from "Beat Instrumental" 12/71. 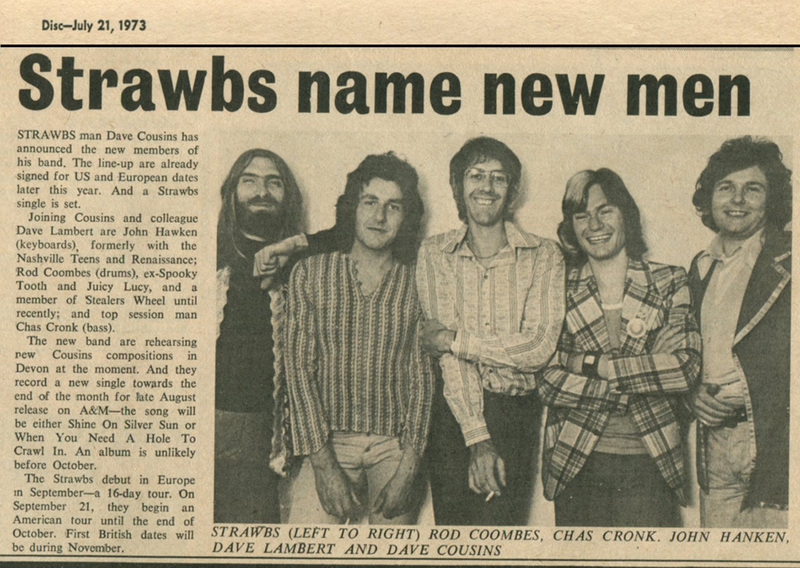 more like early Genesis than Strawbs. 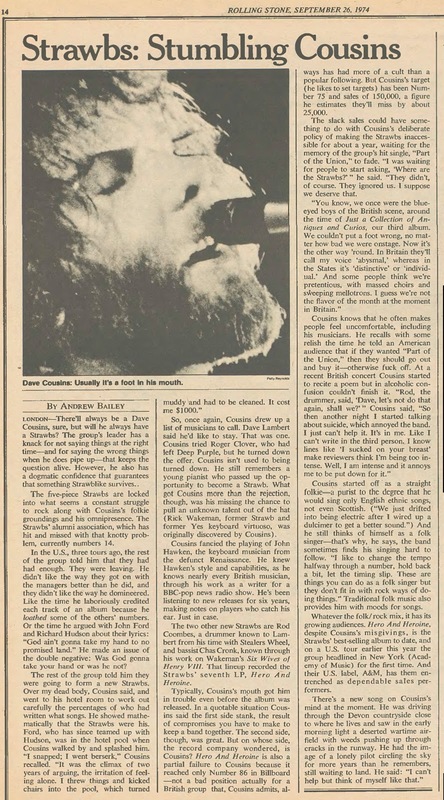 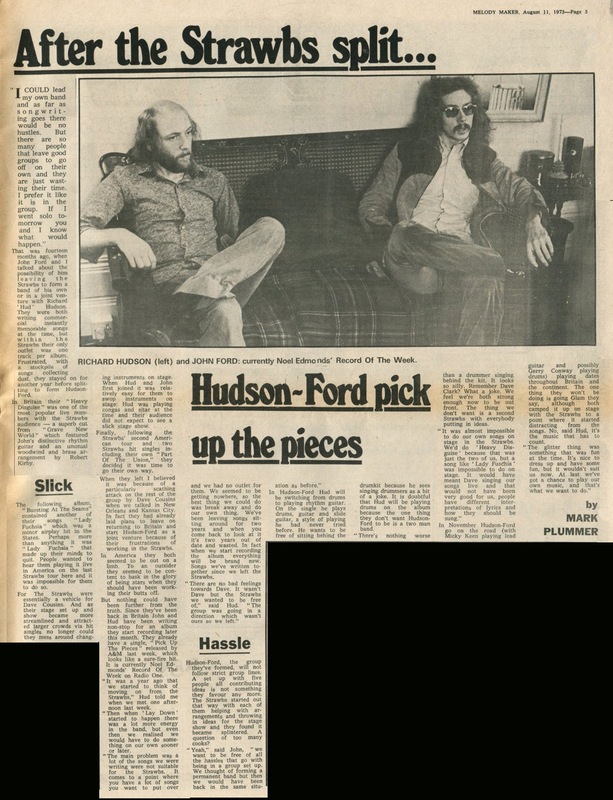 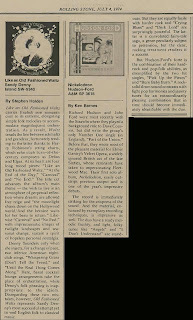 A review of "Grave New World"
at the Seams", June 7th, 1973.
discuss their new band, Hudson-Ford. 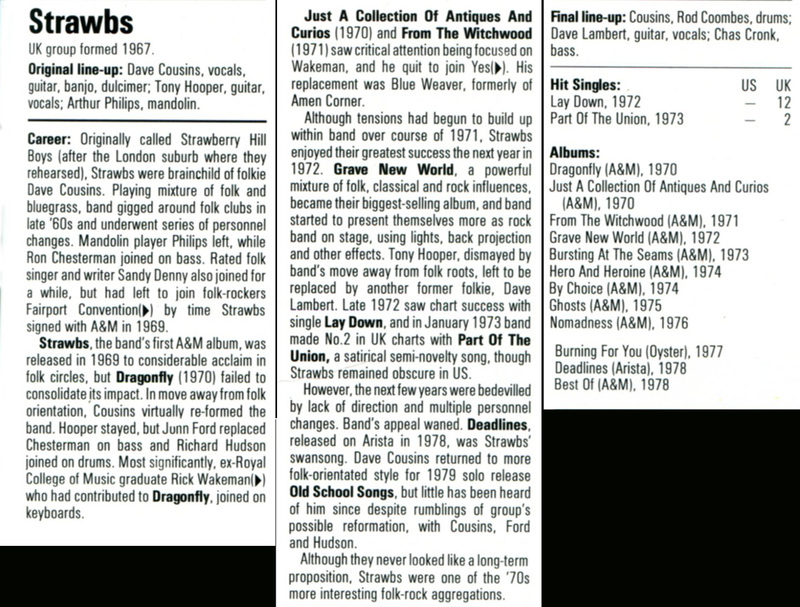 are reviewed at the same time. 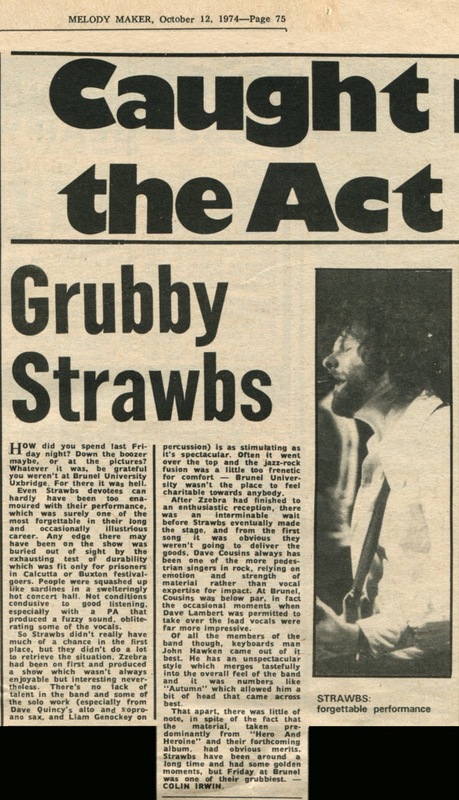 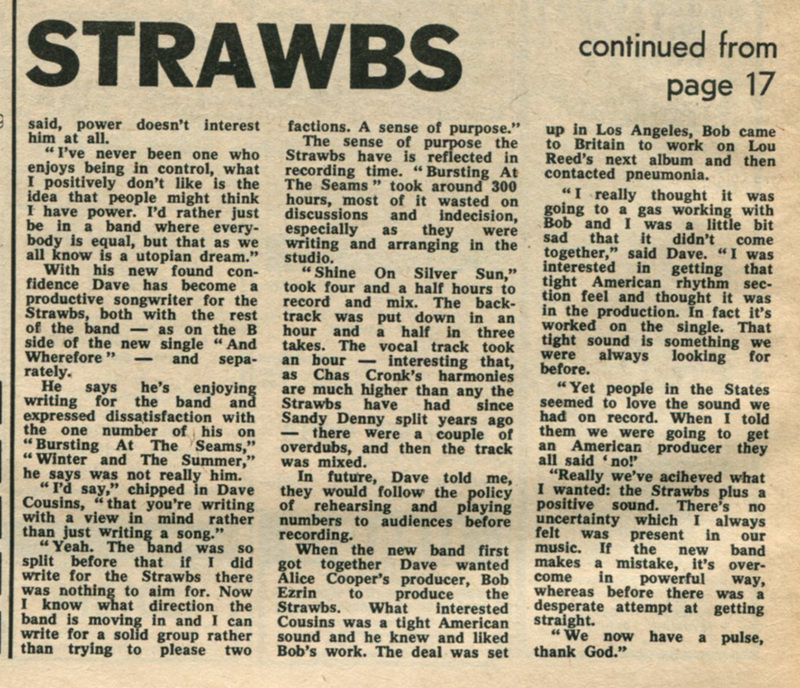 that make up the Strawbs' story. 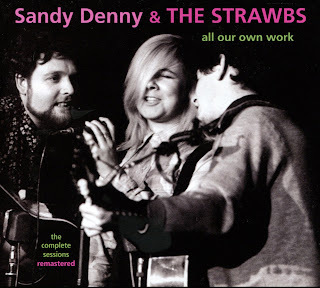 by Cousins with Sandy Denny doing lead vocals. 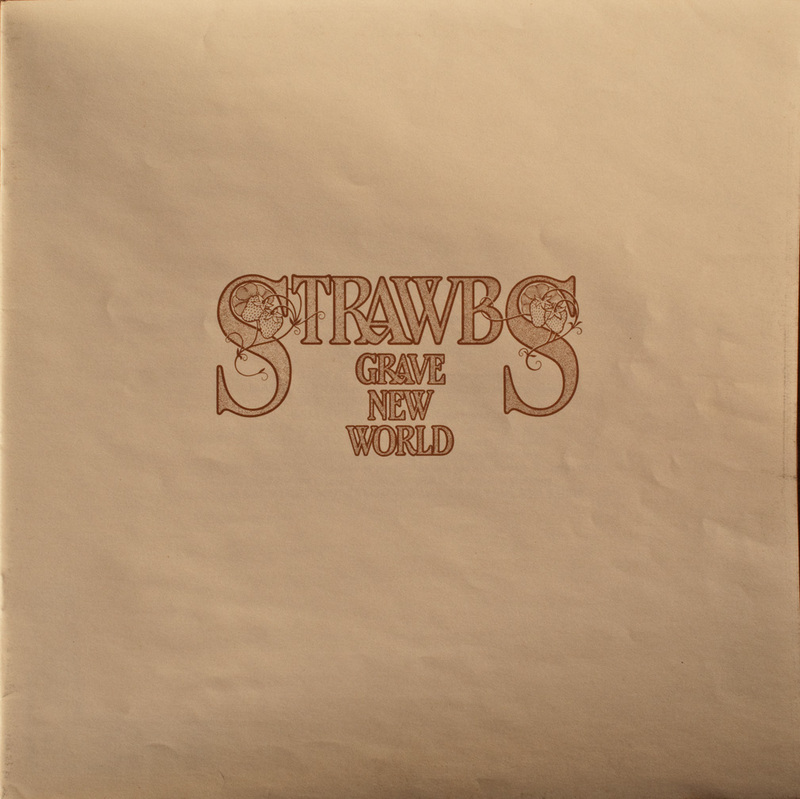 first recorded with the Strawbs. 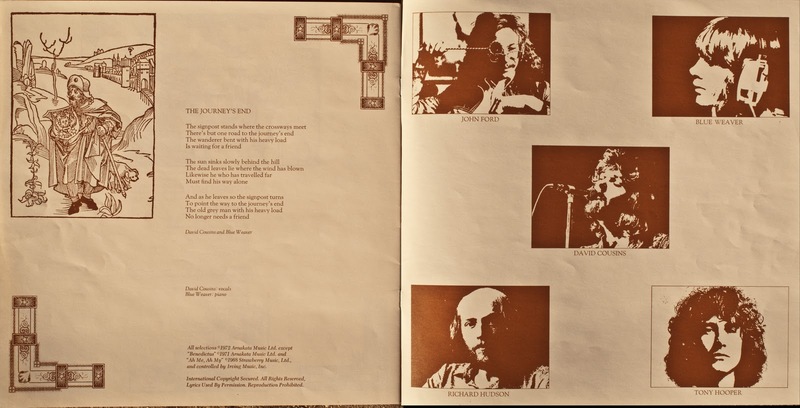 and Rick Wakeman did session work for that album. 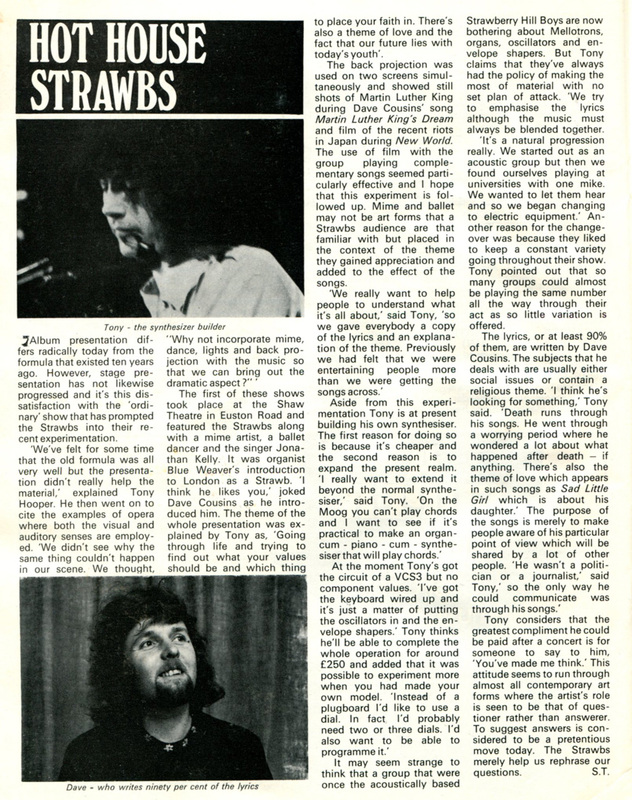 Six months later all three joined Strawbs. 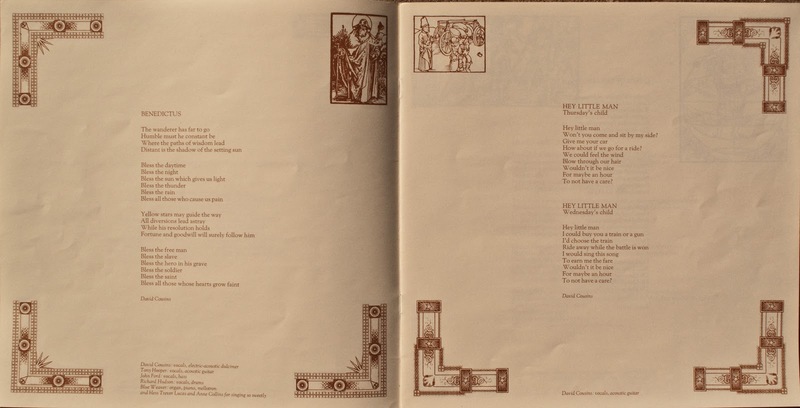 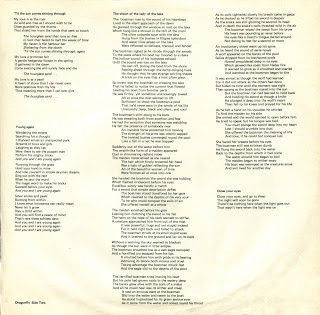 in the band, Elmer Gantry's Velvet Opera. 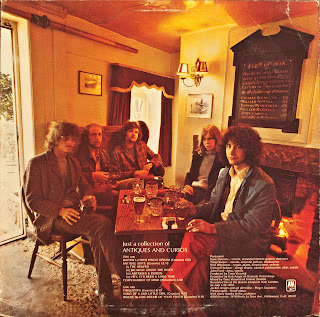 in England, but unknown in the US. 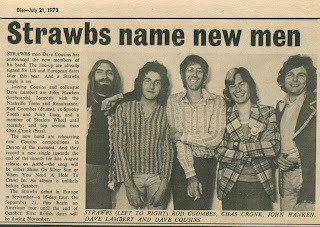 but was not an official member. 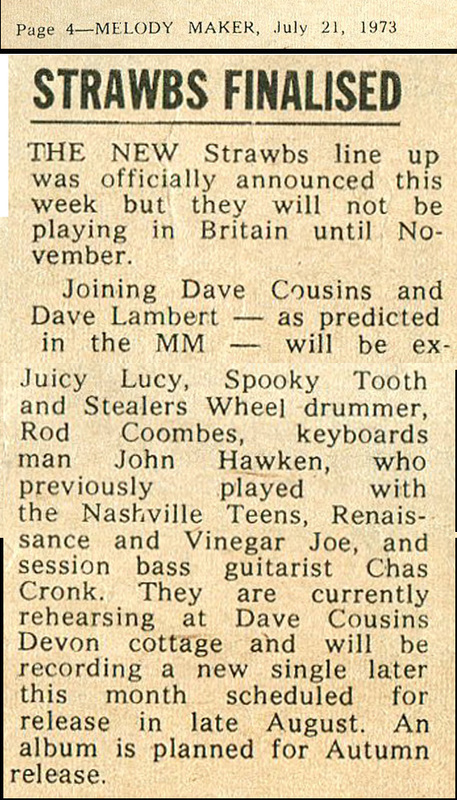 Queen Elizabeth Hall, London 1970. John Ford and Richard Hudson. 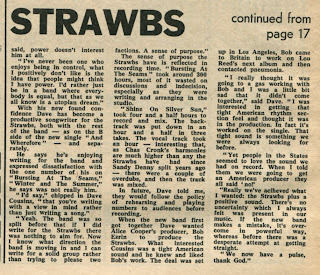 Their fourth was a studio album. date. 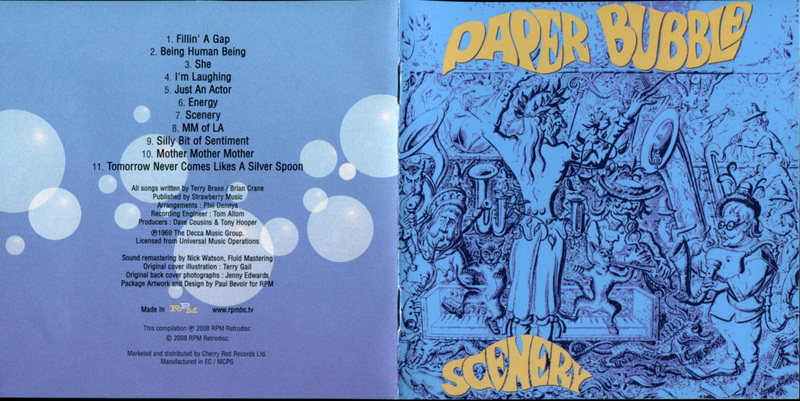 Blue Weaver had replaced Rick Wakeman. 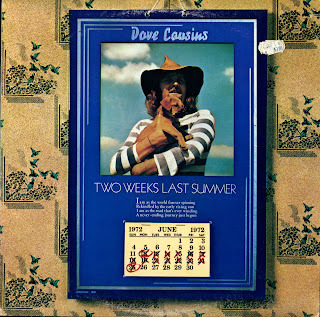 left Cousins with extra songs he had written. 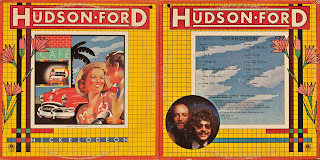 both played on it. It was released in 1972.
members from the band Mungo Jerry. 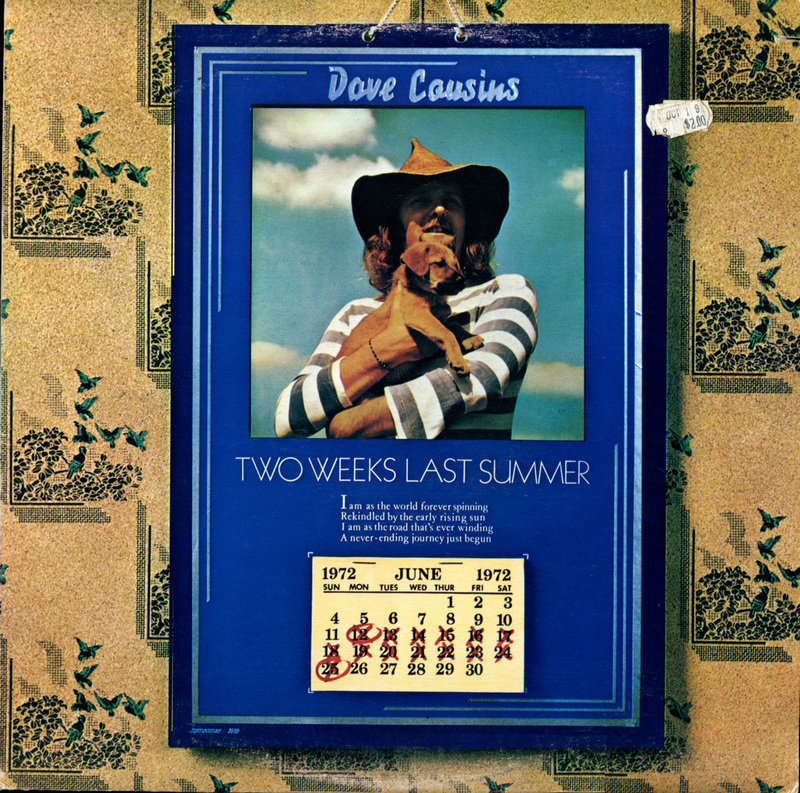 Dave Cousins produced some of their music. 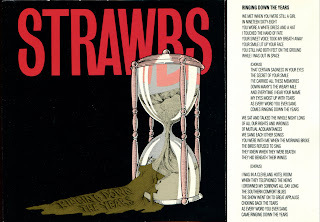 by Dave Cousins, "Lay Down". 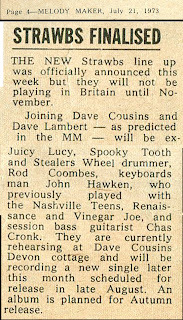 It also included "Burn Baby Burn"
Dave Cousins lent his voice to The Intergalactic Touring Band. 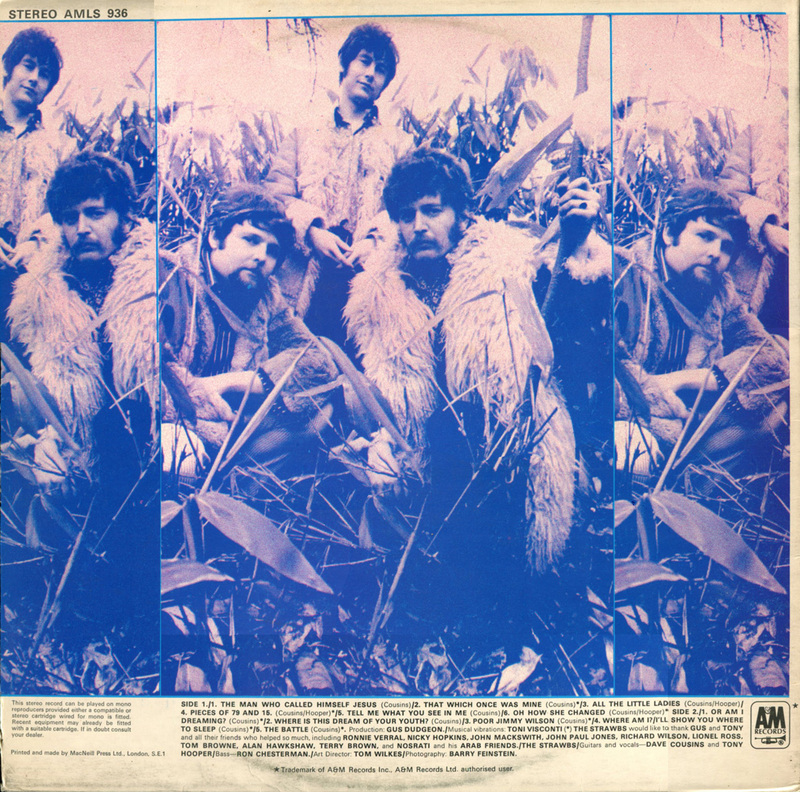 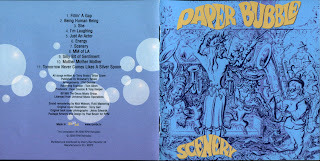 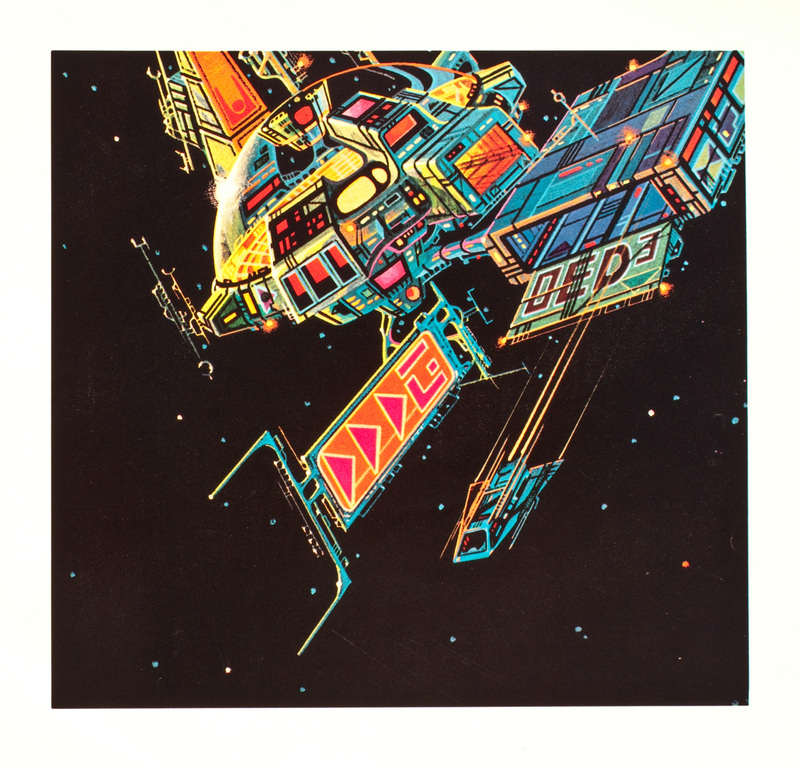 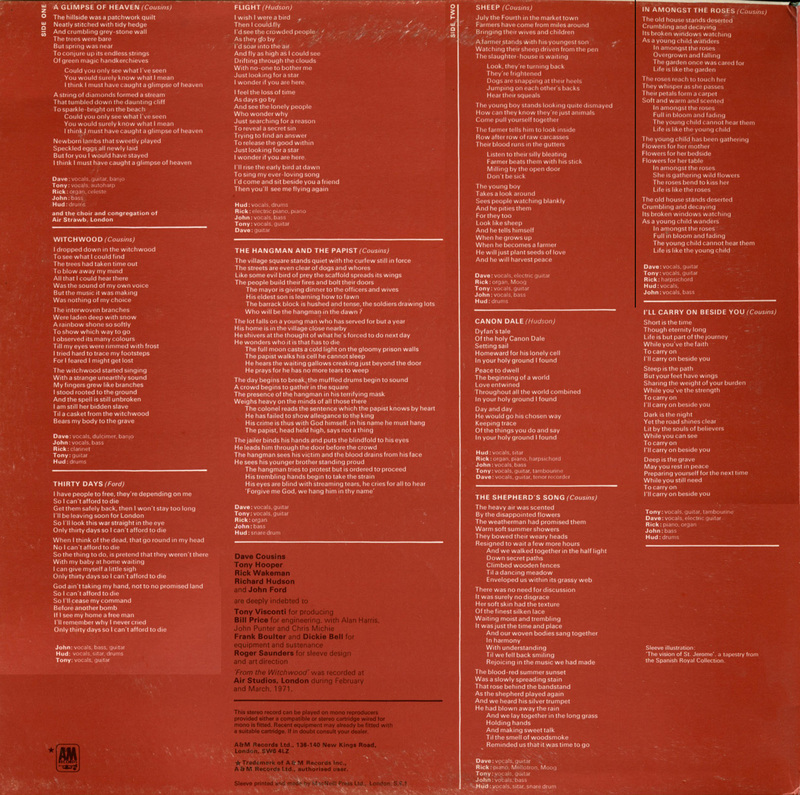 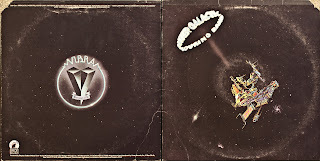 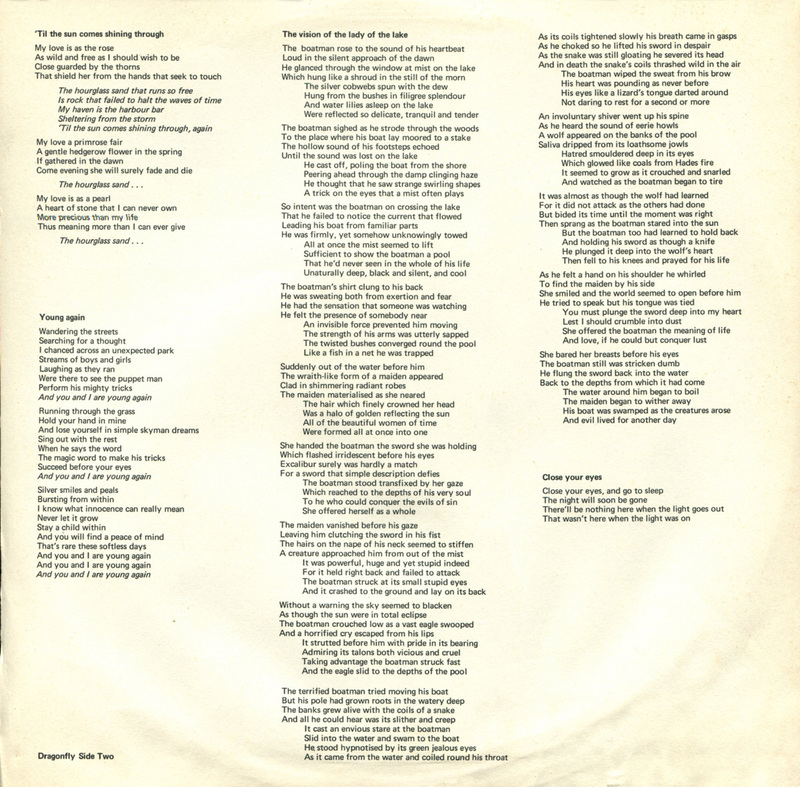 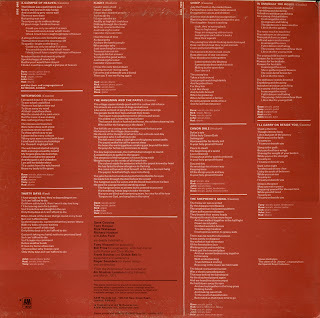 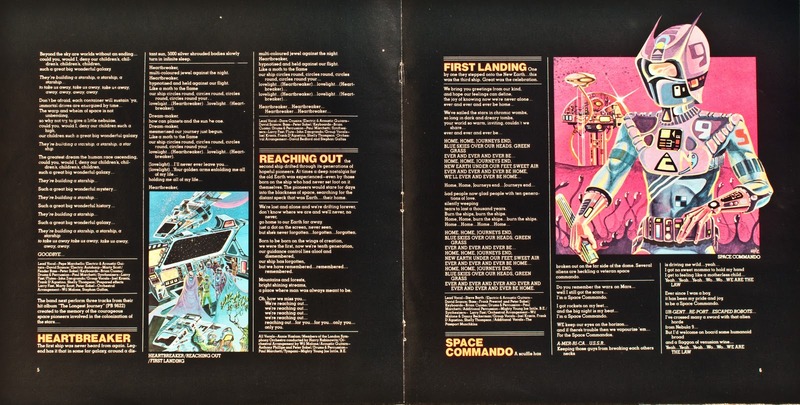 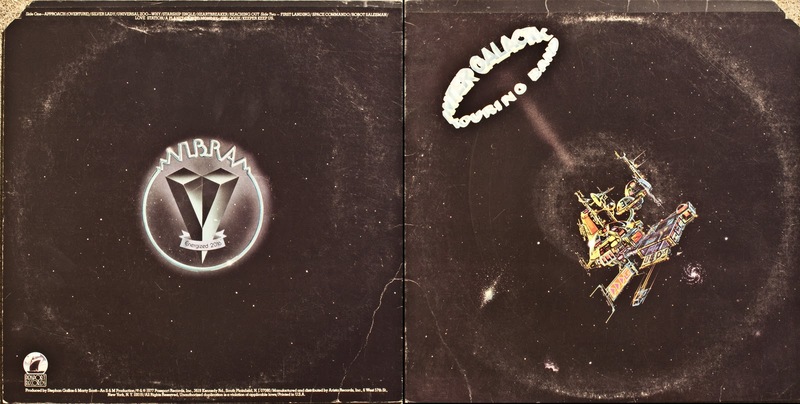 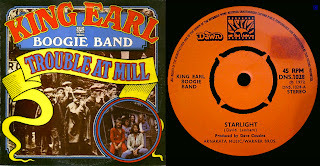 It was not a real group; it was a science fiction concept created and organized by Stephan Galfas and Marty Scott, written by Danny Beckerman and Wil Malone, and recorded as a one-off all-star album by a large cast including Rod Argent, Arthur Brown, Clarence Clemons, Annie Haslam, Ben E. King, and Meat Loaf, among many others, in 1977.
for the album "Don't Say Goodbye". 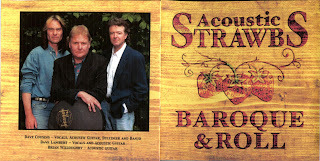 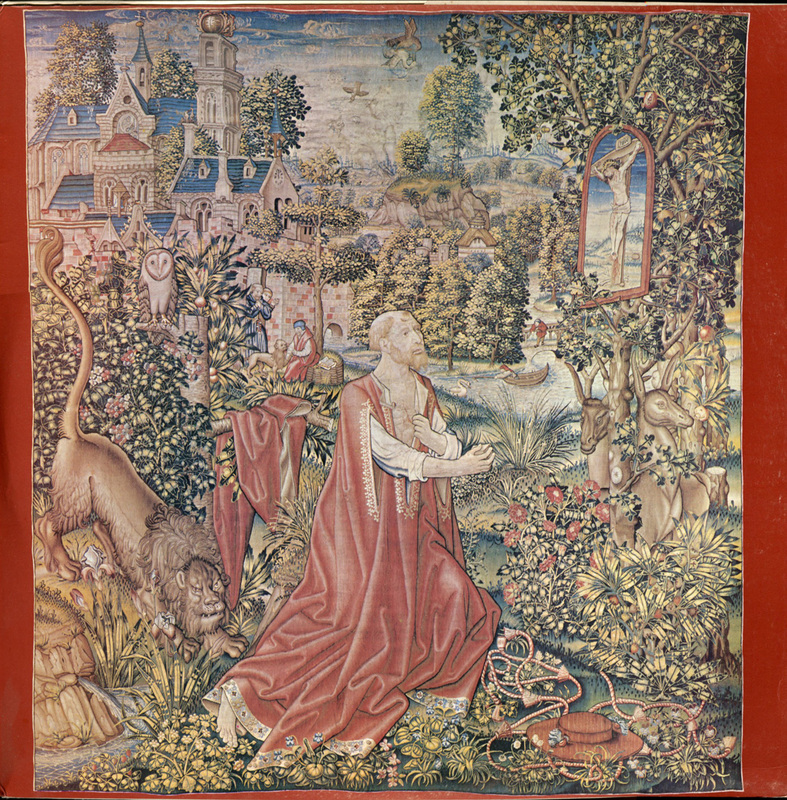 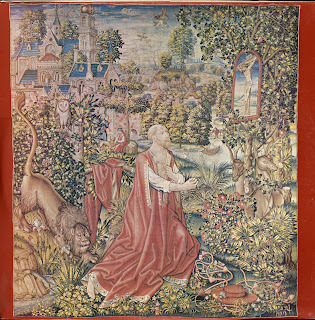 An acoustic album, "Baroque & Roll"